Many factors must be considered when determining Madame Alexander doll values. In addition to the factors listed above, the principles of supply and demand and the current doll market also have an effect on the values of Madame Alexander dolls. Since many different Madame Alexander dolls were created using the same face molds and body styles, sometimes it is nearly impossible to distinguish a doll's original character without its original costume and accessories. Madame Alexander collectors generally want dolls wearing their original clothing. Without the original clothing a doll's value is greatly diminished. Just as in the case of all antiques and collectibles, there are several different values attached to Madame Alexander dolls. Retail value refers to the selling price of a secondary market doll in an antique or collectible shop. In the case of newly released Madame Alexander dolls, it is the selling price in a department store, toy store or other type of retail outlet. Auction value is the actual selling price of a doll when it sells at an auction. This is also known as the open market value, or open market price. Fair market value is the price that both the buyer and seller agree upon. Both parties must be made aware of any information that is relevant to the sale of the doll. Wholesale value is generally thirty-three to fifty percent less than the retail value of a secondary market doll. It is also known as a dealer's price. For newly released Madame Alexander dolls, the wholesale price varies depending on the volume of the retailer's purchase. Estate value, or tax value, is determined by taking an average of the actual closing auction prices of the same doll, in the same condition. Insurance value is the cost of replacing the doll if it was stolen or destroyed. A valuable online resource for Madame Alexander doll collectors is Doll Values, a simple to use database listing approximately 5,300 Madame Alexander dolls. To search for the current doll values, you simply input a keyword pertaining to the doll, its name or part of the doll's box number. 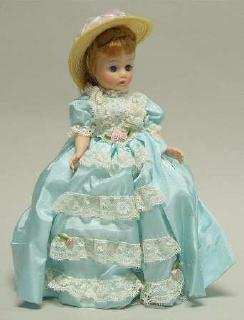 eBay is an excellent resource to find the current auction value of modern, vintage or retired Madame Alexander dolls. By checking the completed auction listings for the exact same doll as yours, you will find the auction selling price, or auction value, of the doll. Always make sure to compare dolls that are similar in condition to yours. Whether you are a serious doll collector or have a few treasured Madame Alexander vintage dolls from your childhood and want to add to your collection, being aware of current Madame Alexander doll values helps you to shop wisely for the next beautiful addition to your doll shelf.